*We will match any competitors price. We are serious about kilns. At Jen-Ken Kilns, you can speak with a kiln advisor and decide which pottery, ceramic, or glass kiln is best for you. For information on knife kilns, please go to www.knifekilns.com! 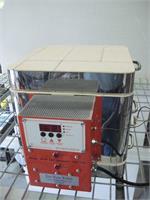 Then, when you are ready, you can order the kiln directly from the factory. It will be built and shipped directly to you. You can call us once it arrives and we will take the time to help you "push the buttons" and get the kiln doing what you want it to do. We are here for you! We offer evening and weekend phone numbers just in case your studios need a little programming help. 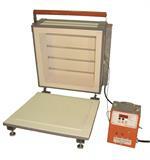 We are here to help you with kilns and firings. We think of ourselves as artists that build kilns, since we've fired just about everything there is to fire. For information on classes, or to follow our blog or Facebook, click here! Inside measures 9" long 9" wide by 9" deep. 120 volt 15 amp circuit with an actual amp draw of 13 amps. AF3P Controller Comes with 8x8 shelf, posts, kiln wash, and base brick to go under kiln. Inside measures 9" long 9" wide by 9" deep. 120 volt 15 amps Needs a 20 amp circuit AF3P Controller Base brick to go under kiln. 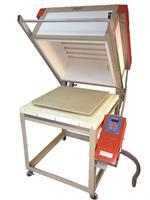 For this kiln with a hole in the floor and designed for glass stringer pulls, it has to be on a steel rack. Jen-Ken Kilns Exclusive Fiber Kilns! The Bonnie Glo Tilt - 15" x 6"
Do you need help with Financing? Navitas Credit Corp. is a nationwide direct lender with a focus on the small and medium sized business sector. Navitas provides capital in the form of leases, loans and working capital to assist businesses in acquiring the equipment and financing they need to grow and stay competitive. Navitas was ranked in the 2014 edition of the INC 500 and the 2015 edition of the INC 5000 as one of the fastest growing private companies in the country. In addition, in 2015 Navitas was recognized as one of the largest financing companies in the sector by the Monitor Daily, the most prestigious publication in the equipment financing marketplace.